Colombia is an incredible country, the variety of nature, and the warmth of its people, makes it, a very special place on earth, and is a touristic jewel to be visited. There are no seasons in Colombia, as is located between the tropics and in the equatorial zone; there are only rainy or dry months, and temperature goes from very hot to freezing, depending on the altitude of the location. So, because of this circumstances, the culture, and the food is different according to the region where you are at. In the next lines you will know what foods you will have to eat, if you want to taste the flavors, when visiting Colombia for a short period of time. 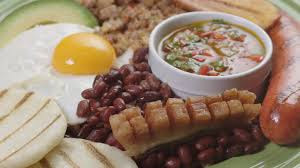 The Bandeja Paisa is a full combo of food that will leave you completely satisfied. It has as many ingredients as you can dream and they all taste good.